Visiting a little town in the Netherlands and Jetske parked the car in front of this building and we went and explored the town. 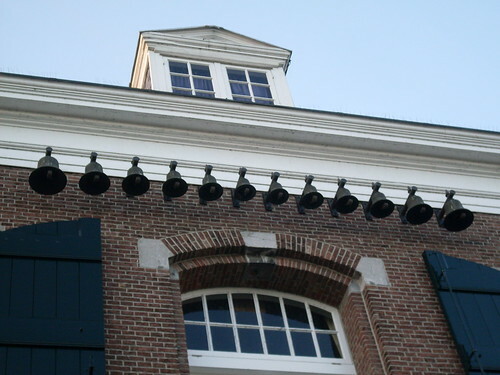 When we came back to the car we were talking about Sinterklaas in Netherlands and we spotted these bells on the building in front of us and right at that moment these bells played a popular Sinterklaas Christmas song. A magic moment. That’s very cool! We kittehs don’t travel much so this is how we see the world! So nice the bells start to playing that song, it looks they playing for you! That is a great shot of bells! Gostei, uma fila de sinos, eu nunca havia visto assim antes! Um abraço! It does sound like you experienced a magic moment! The ‘leave a response’ was not opening for me there, for a while. But I finally got in. This image of the bell tower is great. I bet the sounds are fabulous. Lindos sinos ali colocados! Adoro sinos! beijos,chica e um lindo domingo! I was trying to find out how do the bells play the Christmas song. Then I discovered the bells are in different sizes. Clever! What a beautiful capture, I can almost hear the bells ringing that song.